The gloves are off. According to a study released by the U.S. Department of Education, in every single category except three — culinary arts, aesthetology and cosmetology — mean earnings of students who graduate from career training programs delivered by public institutions are higher than the earnings for students who attended for-profit institutions. The data examined found that among undergraduate certificate graduates in fields that are common to both the public and private sectors (covering about 95 percent of graduates), the average earnings are higher in the public sector at 80 percent of programs, Within the same fields of study, the average difference was found to be about $2,700, 13 percent higher in the public-sector programs than the for-profit ones. The Career Education Colleges and Universities (CECU), the primary trade association the for-profit sector, quickly denounced the findings as using "faulty data." The study was undertaken following implementation of new "gainful employment" regulations tied to student assistance programs, put into effect last year by the Department. In order to be eligible for Higher Education Act Title IV financing, an educational program must either lead to a degree at a non-profit or public school or prepare students for "gainful employment in a recognized occupation." That last category is primarily synonymous with the educational programs offered at many for-profit institutions. Under the rules, the Social Security Administration is charged with calculating and returning to the department the mean and median annual earnings of a cohort of students who completed the gainful employment program during a specified period. The regs were put into place by the Obama administration ostensibly to make sure that career colleges served their graduates sufficiently and that borrowers earned enough to cover their student debt after graduation. 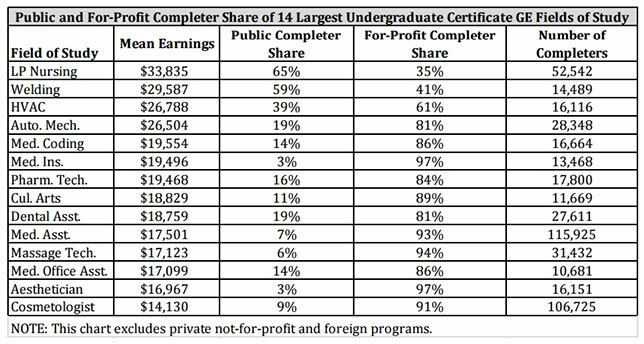 In this first round of analysis, the department found that the mean earnings of graduates of public undergraduate certificate programs were almost $9,000 higher than mean earnings of graduates of for-profit undergraduate certificate programs. According to a fact sheet issued this week, "Public schools outperform for-profit schools both in relative terms and in absolute terms at the certificate level." The study also found that student success is largely tied to the field of study he or she chooses to pursue. Among the 14 largest gainful employment fields of study, 12 job segments had more for-profit "completers" or graduates than public completers. The highest mean wage among those 12 was $26,788, earned by HVAC workers. The lowest, at $14,130, was cosmetology. The field of study for medical assistants had the largest number of completers — 115,925, of which 93 percent were obtained at for-profit schools. The mean wage for medical assistant was $17,501. A report based on the findings noted that the higher earnings experienced by graduates of public undergraduate certificate programs was due "primarily" to two factors, First, those programs have "relatively more" gainful employment students enrolled in relatively high-earning fields; second, gainful employment graduates at public undergraduate certificate programs have higher earnings than graduates of for-profit programs in the same fields. "Of particular concern," the report stated, was the "significant share of programs and graduates" that averaged earnings less than $14,500, the annual earning of a full-time minimum wage worker. Of the 14,522 records included in the data analysis, 15 percent of the credentials showed average earnings under that threshold, and 70 percent of those programs were delivered by for-profit schools. In January, the department expects to release debt-to-earnings metrics. Those programs that fail the metrics and don't improve will end up losing eligibility for federal student aid. The College Scorecard will also be updated to include earnings data for educational programs of federal financial aid recipients. However, at least one organization has already begun arguing that the data has problems. "The U.S. Department of Education has fulfilled what was our greatest concern around the gainful employment regulation — the use of faulty data that lacks context," said Steve Gunderson, president and CEO of CECU, in a prepared statement. "It is absolutely absurd to compare totally different fields of study and suggest that programs traditionally taught in public institutions have higher incomes than programs taught in proprietary colleges. This reflects the continuing ideological bias of this department against our sector and is yet another example of why Americans are tired of out-of-touch bureaucrats in Washington." Gunderson argued that reviewing gainful employment data requires also examining where a person lives, which "can have a significant impact on their earnings — you can have the exact same program in a high wage urban area in California and a low-wage rural area in the Midwest and have two totally different outcomes related to earnings." "Without seeing the department's underlying datasets it is impossible to fully answer any of these questions. But geography, age, race and gender are all factors here," he added. The data was made available for public viewing in a downloadable Excel spreadsheet on the Federal Student Aid website here. A fact sheet about gainful employment earnings is available on the Department of Education website here.